Chervin is a complete custom kitchen cabinet manufacturing company located in the small town of Hawkesville, Ontario, in the heart of Waterloo County. View our galleries of kitchens, vanities, and custom woodwork. four profiles were found for Chervin.ca in social networks. Among other social networks the website is represented in Facebook, Twitter, Pinterest and YouTube. The web server used by Chervin.ca is run by SherWeb and located in Canada. On this web server 16 other websites are hosted. The language of those websites is mostly english. 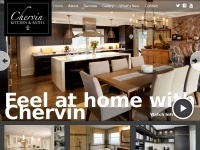 The Chervin.ca websites were developed using the programming language PHP and served by a Nginx server. For managing the data of the webpages the CMS WordPress in the version 4.8.5 is used. The website uses the latest markup standard HTML 5. To analyze the visitors, the websites uses the analysis software Google Analytics. The website does not specify details about the inclusion of its content in search engines. For this reason the content will be included by search engines.